Though their meaning and intent are identical, crocodiles are better known for their tears than for their smiles. So are Russian officials. Take Igor Shuvalov, the first deputy prime minister, for example. When the chief executive of one of the largest mining companies in the world came to Moscow, a member of his entourage recalls, the senior government official he was scheduled to meet was Shuvalov. But the latter kept him waiting in the anteroom to his office. When Shuvalov finally appeared, the source remembers, “he apologized for keeping us waiting. He smiled.” Nothing concrete or valuable materialized at the meeting, nor since. But Shuvalov is remembered for smiling. The reason is that the chief executive of one of the largest mining companies in the world believes Russian officials never smile. Over the past month Shuvalov has been displaying fewer crocodile smiles, more crocodile tears. Very publicly he has announced his opposition to the bailout loan of €5 billion requested from Russia by the Cyprus government. He may have told the European Union and the International Monetary Fund (IMF) that he wouldn’t be opposed if they used Russian deposits in Cyprus banks to fund the bailout, instead of the Russian government. That story was told here. Weeks before, on January 22 Shuvalov had announced his intention: “I do not want to provide any money to Cyprus … We have to be very frugal.” Whether he said the same thing on March 18, when President Vladimir Putin called an emergency Kremlin session on the Cyprus bailout, isn’t known. What looks clear in retrospect is that Putin decided to change his mind, or to change his tune. Russian money was provided for the bailout, as Putin hinted it would be. But the money belonged to Russian individuals and companies, not to the state. Shuvalov hasn’t explained why exactly he appears in public at least to be so hostile to the Republic of Cyprus. Nor has Shuvalov explained how it happened that a state company he knows very well, the shipping company Sovcomflot, appears to have known in advance what was about to happen to its money in a Cyprus bank. According to Cyprus records , on March 14, two days before the bailout crisis triggered the March 16 freeze on all bank deposits in the country, Fiona Trust & Holding Corporation managed to empty its Cyprus bank account of just over €6 million. The record of the transaction appears on the 5th line of this listing. Readers are invited to examine the names of other Russian-owned companies on the list, the size of their withdrawals, and the timing, to determine who else may have anticipated what was about to happen, and who tipped them off. The list, which has been leaked to the Cypriot press from Cyprus banking sources, does not pretend to be comprehensive of all last-minute withdrawals of Cyprus bank accounts before the freeze, and the subsequent expropriation. Did Shuvalov privately and non-transparently warn Sergei Frank, chief executive of Sovcomflot, the parent of the offshore group of Fiona corporate names, to get money out of Cyprus? Shuvalov was chairman of the Sovcomflot board between 2004 and 2007. During that period he and Frank initiated one of the most costly court cases mounted by a Russian state company in the UK courts, only to have the core allegations of bribery and corruption dismissed by the High Court and the Court of Appeal, with costs and an indemnity awarded against Sovcomflot. The irony of that claim has been that if it were applied to Shuvalov’s conduct, and if he were subject to British law on corruption and bribery, he would have more defending to do than he has done so far. For Shuvalov’s claim to be judged by the standard of Russian law, not British law, read this story. Is Shuvalov also allowed by the president to exempt his personal conduct from the de-offshorization policy which Putin announced last December, and which the Kremlin intimates was the reason for letting Russian deposits in Cyprus banks suffer the so-called bail-in or haircut? The zoological characteristic of crocodiles is that they are predictable; they can’t help their insincerity and hypocrisy. It’s biological, a force of nature then, which explains Shuvalov’s opposition to the use of offshore registration for Russian companies in Cyprus, and at the same time his use of multiple offshore registrations for his private business in the British Virgin Islands (BVI). The evidence has already been disclosed by Barrons and other press of Shuvalov’s operation of the Bahamas-registered company Sevenkey Ltd. to amass a fortune of $70 million between February 27, 2004, and July 31, 2007. According to this version, Sevenkey had been owned by another Bahamas corporation which was in turn owned by a trust for Shuvalov managed by lawyers and partners at Shuvalov’s old firm, ALM. Then, in January 2008, Sevenkey’s ownership was restructured so that it became the property of Radcliff Business Ltd. in BVI. The Barrons investigation reports that Radcliff’s bank accounts received almost $114 million from Sevenkey. Sevenkey money appears to have paid for the homes in the UK and Austria which Shuvalov and Shuvalova identify as their own in their government assets disclosure for 2011. A fresh data set which has just leaked from BVI reveals that on January 4, 2008, two companies, Plato Management Ltd. and Radcliff Business Ltd., were incorporated by a Vanuatu-based company called International Administrators Ltd. and registered in BVI as owned by Olga Shuvalova. A director appointed with her is identified in the BVI records as Sergei Kotlyarenko. Owner of both Plato and Radcliff is Severin Enterprises of BVI. Kotlyarenko is also a director on record with Shuvalova of Severin. Severin had been transferred by the Vanuatu company to Shuvalova on October 30, 2007. 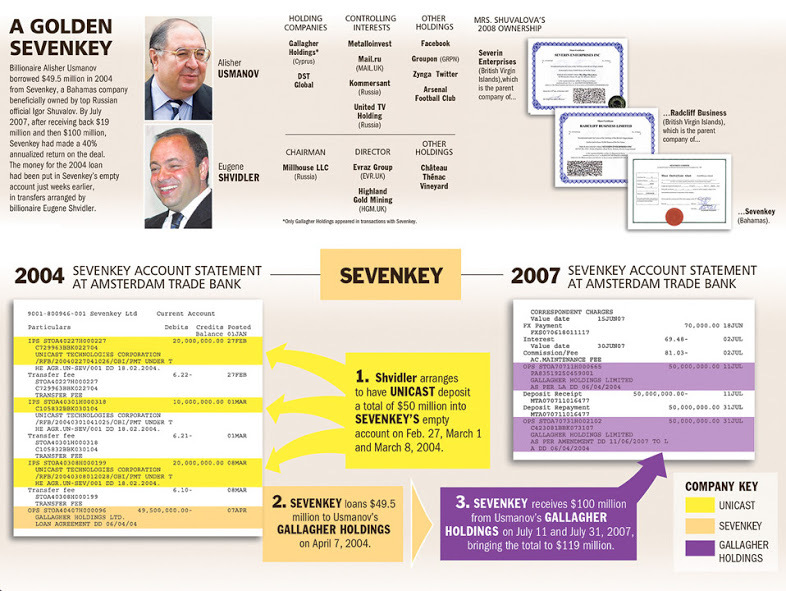 The Sevenkey transactions put Shuvalov on the receiving end from Evgeny Shvidler and Alisher Usmanov. But they were completed in July of 2007. Why then, two months later did Shuvalov and his wife reregister the ownership of Severin? Why, six months later, did Shuvalov and his wife create Plato on top of Radcliff, and why change the place of registration for their business from Bahamas to BVI? Were they hoping to make the Sevenkey money trail disappear? The BVI data also reveal that on September 9, 2009, official BVI certificates were issued for Plato and Radcliff, testifying to the Shuvalov ownership and to companies’ probity and the absence in the record of any adverse litigation, claim, charge, or bankruptcy. The documents were also apostilled. This suggests that in another country Plato and Radcliff were setting up new business and bank accounts. Not in Russia, the evidence shows, because the apostilles are in the English language, without a translation. Thus, they were meant to be read in an English-speaking jurisdiction other than BVI. The Shuvalovs were on the move again. A Russian investigator who has questioned Shuvalova on the BVI evidence says she doesn’t deny the registration records; she claims that everything is according to the law. That is certainly true of BVI law. But it is not quite true of the Russian law backing the disclosure of income and assets from non-Russian sources by government officials like Shuvalov. This is the record of his last disclosure dated April 12, 2012. There are references to real estate in Austria and London owned by Shuvalov and his wife, but no mention of offshore companies in BVI or assets they may own in BVI and elsewhere, including bank accounts.